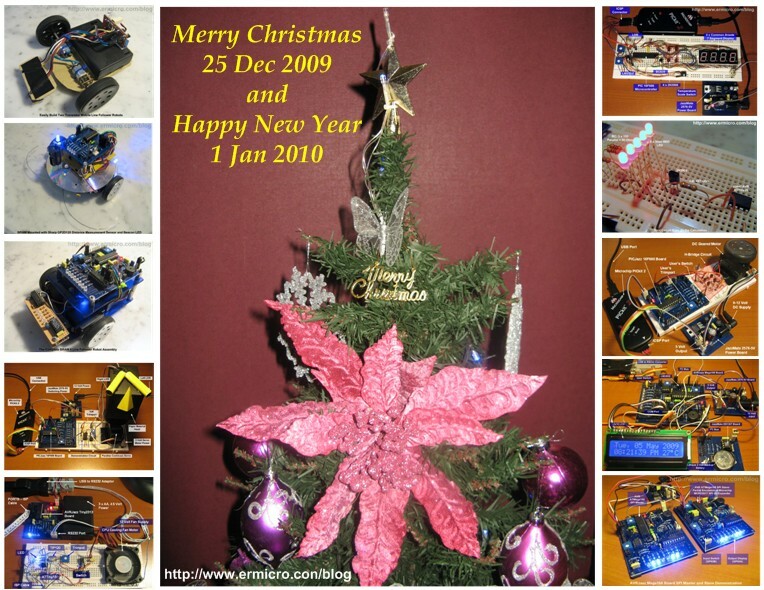 December 18, 2009 by rwb, under Blognote. First of all I would like to thank to all the ermicroblog readers. I started to write this blog about a year ago; precisely on December 2008, during this year I received a lot of comments and questions and some of it were on my email. For me there are no such a silly questions as I believe that as long as we live in this world we always in the continues learning mode state, therefore what seems silly to some people actually is a really serious question to the other people. I would do my best to answer all the questions regarding this blog contents; as answering the people’s question also is a part of the learning process. On this first year I tried to post most of the Microcontroller’s foundation knowledge such as ADC, PWM, Interrupt Services, SPI and I2C, where this important knowledge is needed for understanding some of the next year advanced project. On the next year, I also plan to put some of my most popular posted articles and extent it with more examples and experiments into the ebook (PDF formatted). I do hope this blog could bring a better understanding of how we could make use of the microcontroller in our learning stage or just for hobby and fun. Again thank you for your support and encouragement.